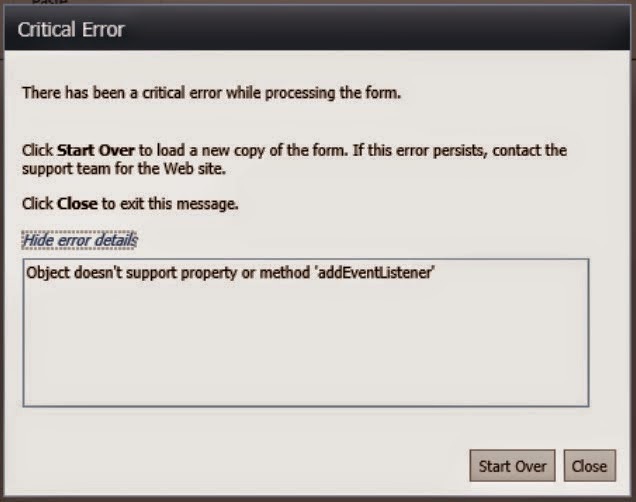 More SharePoint: "Object doesn't support property or method 'addEventListener'"
"Object doesn't support property or method 'addEventListener'"
I've just been advised about an issue by two of our customers who are using a form that we've developed in InfoPath and deployed as a solution almost a year ago. It was all working smoothly. I've tested on my dev environment and I could not reproduce the issue with Chrome or IE10 although I have the same version of the solution. It turned out both customers have upgraded to IE11 and the issue did not exist in Chrome for them. Both customers are still on SharePoint 2010, so I was eager to turn on the Compatibility View on IE11 and boom, it worked. A quick research led me to this post and I was very surprised that it also applies to SharePoint 2013. Adding the site URL to the Compatibility View is a quick and easy workaround, but that really shouldn't be the default behaviour, Microsoft. That breaks a lot of other things, for instance if you're using HTML5 on that site (which is very common nowadays), that would not work and it's a big trade-off. Hopefully that gets addressed within a hotfix anytime soon.